I am Jessica Tamblyn and I am an It works Global Independent distributor. It Works is a health and wellness company that is famous for our all natural body wraps that tighten and tone in just 45 minutes. However we also have an amazing array of natural supplements too! Would you like to increase your salons sales? Not only can you incorperate our body wraps into your services but you may like to introduce new services including our all natural facials that minimize the appearence of fine lines and wrinkles. We also have a gel that reduces cellulite and is highly hydrating and feels amazing on the skin. Contact me today to find out how you can become a distributor for these products and dramatically increase your clientelle and grow a very successful salon! 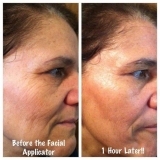 Our facial applicator is highly hydrating and minimises the appearence of fine lines and wrinkles.